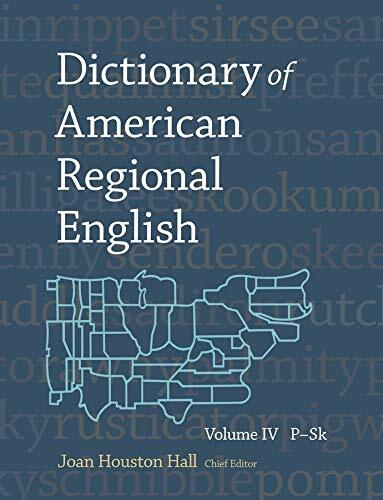 Synopsis: Every page in the new volume of the "Dictionary of American Regional English" makes it wonderfully clear that regional expressions still flourish throughout the United States. Depending on where you live, your conversation may include such beguiling terms as "paddybass" (North Carolina), "pinkwink" (Cape Cod) or "scallyhoot" (West); if you're invited to a "potluck dinner", in Indiana you're likely to call it a "pitch-in", while in northern Illinois it's a "scramble"; if your youngsters play "hopscotch", they may call it "potsy" in Manhattan, but "sky blue" in Chicago. Like the popular first three volumes of DARE, the fourth is a treasure-trove of linguistic gems, a book that invites exclamation, delight and wonder. Nearly 600 maps pinpoint where you might live if your favourite card games are "sheepshead" and "skat"; if you eat "pan dulce" rather than "pain perdu"; if you drive down a "red dog road" or make a purchase at a "racket store"; or if you look out your window and see a "parka squirrel" or a "quill pig". The language of our everyday lives is captured in DARE, along with expressions our grandparents used but our children will never know. Based on thousands of interviews across the country, the "Dictionary of American Regional English" presents our language in its infinite variety. Word lovers should delight in the wit and wisdom found in the quotations that illustrate each entry, and should prize the richness and diversity of our spoken and written culture. Review&colon; A monumental and impressive work. -- Daniel F. Phelan "Language and Linguistics"
More than 20 years in the making, this brand-fire-new tome is loaded with the bare-naked speech that Americans really use when they 'bump their gums' with or without having had some 'sweet spirits o' cats-a-fightin' or 'conversation fluid' to make their chin music happen. The result is a testimonial to the metaphor-making power of the American language at its most vigorous. A monumental and impressive work.--Daniel F. Phelan "Language and Linguistics "
Proof that tourism, television and technological change haven't rounded off all the gaudy and gracious edges of the way we talk.--L. A. Jolidon "USA Today "
A staggering work of collective scholarship..."DARE" is not only a reference treasure for the scholar and the general word lover, it's a lode for raiding parties by specialists of all kinds...Most of all, "DARE" is evidence that American speech will never become stale and fusty, that the great linguistic homogenization of television is a myth.--Henry Kisor "Chicago Sun Times "
It already seems clear that...the dictionary will rank as one of the glories of contemporary American scholarship...it is endlessly rewarding to dip into, and if you look up a particular word or phrase you are in constant danger of being seduced to something else...It is a work to consult, and a work to savor--a work to last a lifetime.--John Gross "New York Times "
To open its pages is to thrill at the exploration of the New World and to trace the course of American history through its language...Its editors, led by Professor Frederic G. Cassidy, have caught the native poetry of America on every page.--Fred Strebeigh "Smithsonian "
This long-awaited, definitive and fascinating "Dictionary of American Regional English" ["DARE"]...is all we had hoped for and more. It includes the regional and folk language, past and present, of the old and the young, men and women, white and black, the rural and the urban, from all walks of life...Although "DARE" will be one of the most scholarly, comprehensive and detailed dictionaries ever completed...it will also be one of the easiest and most enjoyable to use or browse in...This is an exciting, lasting work of useful scholarship accomplished with excellence, a work that scholars and laypeople alike will study, use and enjoy for generations.--Stuart B. Flexner "New York Times Book Review "
Because these volumes are the most complete lexical records we have of the American experience, much of the history and contemporary condition of American society can be found in their pages...We are very fortunate to have "DARE"; it is not a dictionary; it is a national treasure.--Edward Callary "Language in Society "
In its scope and thoroughness, Cassidy's dictionary is unmatched as a kind of refuge for colloquialisms threatened with extinction...Writers, etymologists and other devotees of verbal arcana have never been given a richer browsing ground. But while they are discovering that a blind tiger is a place to buy and drink moonshine, or that there are 176 names for dust balls under the bed, they are also bound to be awed by the dictionary's staggering scholarship.--Ezra Bowen "Time "